Custom illustrations are back in time for the holidays. Send us a photo of you and your horse and we will turn it into our mosaic style! Perfect gifts for yourself or someone that likes horses. Contact us for more details and photo requirements. Excited for the year to come? Thinking of trying a new riding discipline with your horse? Our 2019 calendar is sure to give you some ideas! Available as a 11 x 17” downloadable Pdf, perfect for your wall. Click on the banner for more photos. Transylvania is a beautiful region in Romania, famous for its fairytale landscapes, mountains, lakes, castles and also horse riding. This month we decided to do a short riding trip on the green hills and forests of Mures county, and booked a two days stay at Cross Country Farm in the village of Prod. This wonderful place has over 20 years experience in the professional equestrian field, over 30 horses, and offer a wide range of riding, from beginners to advanced, competition training, trail rides and children summer camps. The accommodation is gorgeous, there are six beautifully designed bedrooms, with lots of attention to detail, and the instructors are very friendly. Click through the slideshow for more gorgeous views. In our design studio, we often like to explore new ideas with our horse illustrations. Here are some of our concept blanket designs with a dressage theme. Which one is your favorite of the three? Let us know if you'd like to see this as a future item in our store. This past month, on a quick trip to Croatia we took the opportunity to ride in the beautiful countryside. Mustang Ranch is located near the city of Sinj in Croatia. It is less than an hour away from Split, the main city in the area with an airport. They specialize in week long riding treks and also cater to the beginner with 2-3 hour trail rides. For the more advanced riders, there are plenty of gallop opportunities and the guide caters to your riding level. With a restaurant on site and friendly guides, this is a fun place to visit and enjoy nature. Sinj is also very popular for its horseback riding tournament, Alka Knights' Tournament that happens yearly. During the contest, knights ride horses at full gallop pointing lances at an iron ring hanging on a rope. A long tradition dating back to the 18th century! If you are visiting Dalmatia and would like to take a short break and go ride, check them out on their website at http://mustang-sinj.net or email mustang-sinj@net.hr. Have you wondered how you and your horse would look like in the Horse On The L o o s e style? Do you love modern art and need a new piece on your wall? If your inner artist says yes, get in touch with us at shophorseontheloose@gmail.com for more details and requirements. Not long ago, actually it's been more than ten years, we tried out oil painting and what else was there to paint besides horses? Polo riders and their horses on the field turned out to be a very dynamic subject. Years later, although we don't play polo ourselves, we liked the sport and wanted to showcase it in our collection. Polo is featured on one of our embroidery patches, as well as on the C4 equestrian belt collaboration. We're cantering into 2018 and also reflecting upon last year, all the new people we've met and places we've been. We are very excited to share with you new products as they become available. To a happy horsey year! We are very excited to introduce our brand ambassador, Scarlet Walker. We visited Scarlet at her beautiful place in Malibu and went on a scenic western themed ride. Scroll through our photos in the slideshow below. And make sure to follow Scarlet on Instagram @malibucowgirl to fall in love with her equestrian journey. We love reading about all things equestrian and wanted to share with you a magazine we think it is not only very stylish, but has articles we enjoy reading. Horse & Style would make anyone love horses! We like it so much, we decided to do an ad in this year's Fall issue. Horse on The Loose is excited to have our bags go to the Equus Film Festival this year as prizes for the WINNIE Awards!! 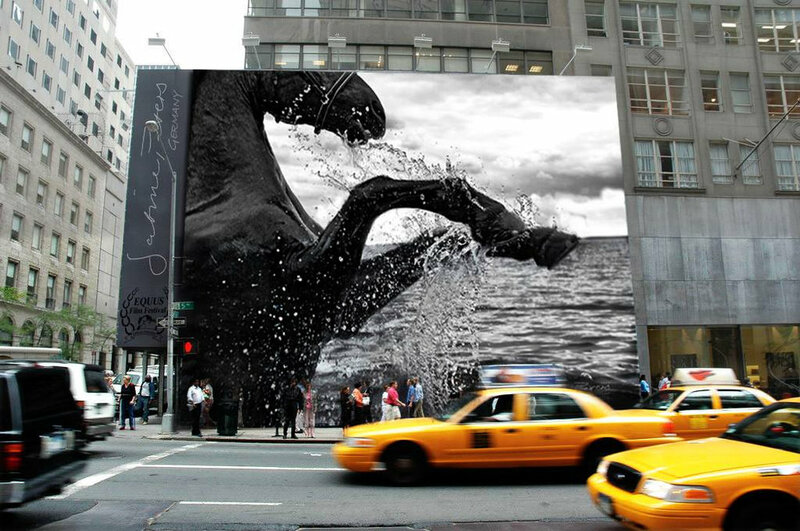 The fifth annual EQUUS Film Festival will take place November 17-19 in New York City and is the first event of its kind to offer a home to the storytellers of the horse world, with films, documentaries, videos, commercials and shorts from around the world and also cultural elements of fine equestrian art and literature. Founded in 2013 the EQUUS Film Festival 2016 presented over 150 films and over 60 WINNIE Awards including Equestrian Art Film, Director, Documentary, Commercial, International, Music Video, People’s Choice and Best of Festival. The addition of WINNIE Award categories in 2016 for Literature and Art will round out our commitment to being the home to the storytellers of the horse world. FOR RESERVING TICKETS GO TO: www.equusfilmfestival.net and click on the Ticket Link on the top left. Here is gallery of photos from past festivals. Photos are property of Equus Film Festival and have been used with their permission. For more awesome highlights visit http://www.equusfilmfestival.net. 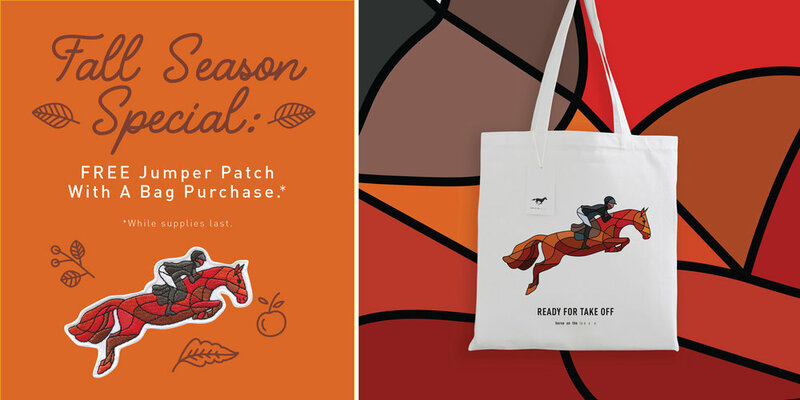 Receive a free jumper patch with a bag purchase anytime during the month of October, while supplies last.